Only 17 percent of women believe it’s very likely they’ll have enough resources to live comfortably in retirement (and nearly one in five say they won’t be able to afford retirement at all). Those concerning findings are from a recent COUNTRY Financial Security Index®, a semiannual survey of 1,000 U.S. adults measuring the overall sense of financial security in the United States. The findings reflect the life hurdles U.S. women face that often vary from men, and require women to think differently about planning for retirement to insure their security. This is especially true for working women with families, and more so for those who are also single. Many women balance family life, including caring for young children and/or aging parents, with active careers. When it comes to money matters, women also have to create a financial plan that addresses how to pay for their children’s college education, while saving for a comfortable retirement. These realities prove challenging for women especially when it comes to saving for retirement. Women often face obstacles that men do not, including less earning potential, possible time off to raise children and a longer lifespan (for women ages 25 to 50, it is between 81.9 and 83.2 years old). In general, women live longer and earn less than men. Therefore, the bottom-line is women need to be saving more than men. Over one-in-three women surveyed feel significantly less likely they will have enough money and resources to enjoy a comfortable retirement. Women are twice as likely to feel significantly less confident than men – 35 percent versus 16 percent – that they will have resources to send children to college. Current economic and financial uncertainties aren’t helping women feel more positive. For example, nearly half of women (49 percent) didn’t add to their savings or investments over the most recent two-month period, compared to 41 percent of men. To top it off, more women are also less confident they will be able to pay their debts as they come due. What’s troubling is that both women and men say they are accepting their current financial situation as the “new normal” and less than ideal. It’s a bleaker picture for women, though, because their sentiments remain closer to the Index’s all-time low score – and three in four don’t see things getting better. The principal reason reflects those various societal issues that act as headwinds for women to achieve financial security. Despite these stats, there are several steps women can take to establish a financial plan and meet their long- and short-term financial goals. Of utmost importance is to develop a process and put a plan into place immediately. Finding a trusted advisor can act as a guide and answer questions along the way. Holding yourself accountable now will make you thankful in the future. 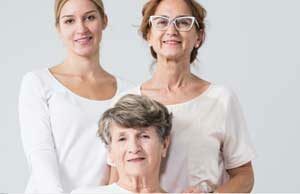 The Women’s Institute for a Secure Retirement urges women to develop three principal sources of money: Social Security, a pension or retirement savings plan such as a 401(k) and individual savings. First, find out about the retirement plans offered by your employer and/or your spouse’s employer. If a defined benefit pension plan is available to you, investigate the payout options. Determine how much income you can expect to receive, the cost-of-living adjustment on the payouts and how payouts are reduced if providing income for a surviving spouse. If your employer and/or spouse’s employer offers a 401(k) or similar type plan, find out how much you can contribute to the plan annually and how much the employer contributes. Consider contributing the maximum amount allowed to your retirement plan. If your employer matches any portion of your contributions, consider contributing at least enough to receive the matching contributions and increase your potential retirement savings. One big mistake people often make is passing up on this “free” money. Additionally, ask about these plans’ investment options and consider also allocating money to an IRA. Think through what you could get in Social Security benefits on your own or from a spouse, if married. Considering the longer life expectancy, what is the potential impact on your overall social security benefits if your spouse were to die? To find out what your Social Security benefits could be when you retire, contact the Social Security Administration at 800-772-1213 or visit ssa.gov. Yes, it’s easier to say than do, but women need to save as much as possible since their Social Security benefits and retirement nest egg tend to be smaller. The first step is to determine your retirement goals by estimating your living expenses during retirement. Make your short and long-term savings goals specific and achievable. Overvalue your money needs because as women live longer, many underestimate the savings they’ll need. The Women’s Institute for a Secure Retirement recommends that given women’s longevity and lower savings, they should try to replace 100 percent of their income during retirement to live comfortably. To help this process, you should establish a comprehensive financial plan. It should include an emergency fund so in the event of a catastrophe you will have a cash reserve large enough to cover three-to-six months of living expenses. Consider buying life insurance to replace your income and provide for your family should you die. Also, plan out how to manage your debt and cover health care and disability expenses. Think about maximizing your avenues of retirement funds with an Individual Retirement Account, of which there are Traditional and Roth IRAs. The type you decide to fund depends on many factors, such as your taxable income and if you or your spouse possess other types of retirement plans. If possible, start depositing automatically a portion of your paycheck into savings to be used for investing, it can be as little as $50 to $100 a month. The latest Index actually found that more women than men – 18.8 percent to 16 percent – have a financial advisor. Still, 38 percent of women don’t have one. Just get started. Put your plan into action immediately. Share your goals with your family, and review them often. If things don’t happen as you originally planned, refine your goals and action plan and continue moving forward.